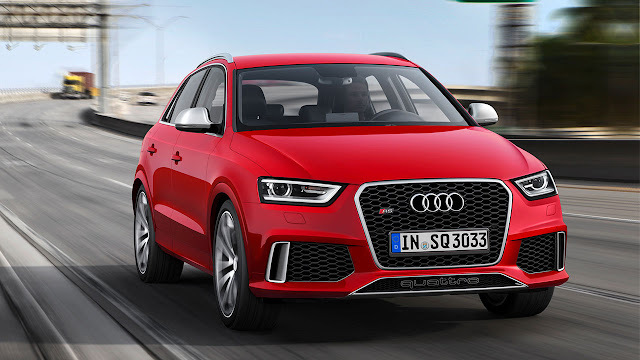 The term ‘sport utility vehicle’ has rarely been more applicable – the new Audi RS Q3 is the first ever Audi SUV to be handed over to the specialists at Audi high performance subsidiary quattro GmbH for the full, no-holds-barred RS transformation. 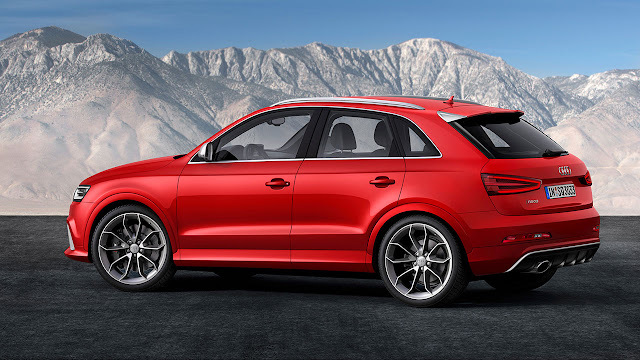 The new 310PS, 155mph Q3 flagship is due to open for UK ordering in the summer ahead of first deliveries in late 2013. At the heart of this RS pioneer is the characterful 2.5-litre TFSI engine familiar from the TT RS and RS 3 Sportback, linked exclusively to a seven-speed S tronic twin-clutch transmission. From 2,480 cc of engine displacement, the turbocharged direct-injection unit produces its 310PS peak at between 5,200 and 6,700 rpm, and maximum torque of 420 Nm (309.78 lb-ft) between 1,500 and 5,200 rpm – values that are unparalleled in this class. These figures translate into a 0-62mph sprint time of just 5.5 seconds and a top speed electronically limited to 155mph. For the first time, the already highly efficient five-cylinder engine is also complemented by a standard start-stop system which, along with a regulated oil pump that only supplies lubricant when needed, contributes to fuel economy that sets a new precedent for an RS model – up to 32.1mpg is possible according to the combined cycle test, equating to CO2 output of 206 g/km. The 1-2-4-5-3 ignition sequence, supported by the geometry of the air induction and exhaust systems, also ensures that the spirit of the legendary five-cylinder quattros of the 1980s lives on in the soundtrack played out by this state-of-the art performance SUV. Drivers can influence the flap control for the exhaust system and the accelerator characteristic via the Audi drive select adaptive dynamics system which is fitted as standard. It offers auto, comfort and dynamic modes, and in the latter throttle response is sharper and the engine sound even more intense. 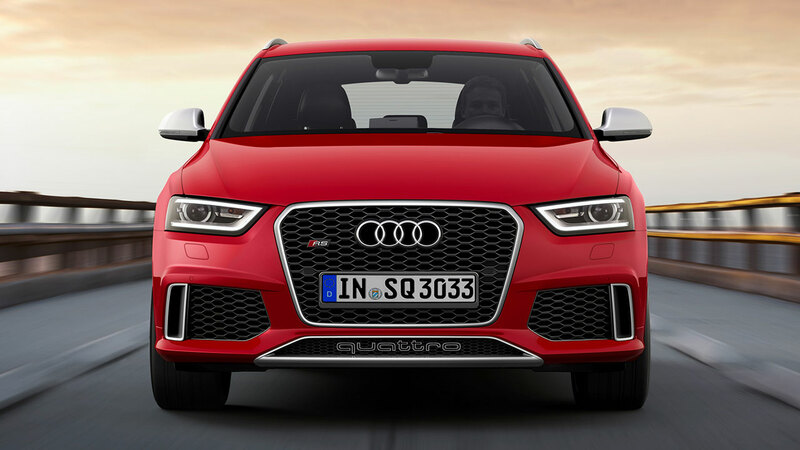 True to Audi RS tradition, quattro permanent all-wheel drive system underpins the RS Q3, in this case the version based on an electronically controlled multi-plate clutch positioned on the rear axle. The system provides swift and proportionate distribution of torque between the front and rear axles for optimum power management in all weathers. It works with RS-specific sports suspension which lowers the body by 25 mm compared to the standard suspension, and which is tuned to deliver flat cornering without forsaking equally important everyday ride comfort. A specially tailored electronic stabilisation control (ESC) also stands guard – it offers a sport mode which raises the limit at which it intervenes, and it can also be deactivated entirely. Electromechanical rack and pinion steering provides quick and accurate turn-in, and ventilated disc brakes provide progressive and steadfast stopping power. The perforated 365mm front discs have a wave design with wave-shaped outer contours, which saves approximately one kilogram of weight at the front wheels. They are gripped by eight-piston calipers painted black with RS logos. An electromechanical parking brake and hill hold assist are also standard. The Audi RS Q3 also demonstrates its special status within the Q3 line-up with RS-specific body detailing, including a high-gloss black honeycomb front grille and RS bumpers, the front treatment including a quattro emblem in the air intake and the rear a distinctive diffuser and large elliptical tailpipes. A roof spoiler, roof rails in matt aluminium and special door sill plates and door trim strips also add emphasis. At 4,410 mm in length, the top ranking Q3 is 25 mm longer than the standard car. It weighs in at 1,730 kg. For even more differentiation, RS Q3 customers can choose an exclusive body colour – Sepang Blue pearl effect – from the list of eight available. The RS accents are naturally also to be found inside. The instrument cluster has grey gauges with white scales and red needles. Contrasting stitching in rock grey trims the three-spoke multifunction steering wheel with its flat bottom as well as the gear selector lever. The MMI and driver information system displays welcome the driver with the RS logo. Drivers can call up the boost pressure, oil temperature and a lap timer via the RS menu in the driver information system. Black headlining is standard, with a lunar silver headlining available as an option, and in contrast the pedals and foot support are finished in bright aluminium. The standard inlays are piano black, but aluminium race or carbon inlays designed by quattro GmbH are also available as alternatives here. The luggage area has a base capacity of 356 litres, which can be increased to 1,261 litres by folding down the split rear seat backs. A practical reversible load liner is standard, and customers who have even bulkier loads to transport can specify a towing bracket. In the infotainment area, a modular component system offers a wide range of options; at the top there is the hard-drive based navigation system, MMI Navigation plus. A BOSE surround sound system driving 14 loudspeakers can also be added, bringing up to 465 watts of output power, while Audi connect brings the Internet to the car. Highly advanced driver assistance systems can also be incorporated.